On February 24th GROSVENOR opened its Spring season with the much anticipated auction of the Kiddle Brothers Collection, a fascinating all World assembly of material compiled over many years by two of Britain’s leading philatelists, Charles and Francis Kiddle. The 478 lots achieved an excellent total realisation of £219,347, well in excess of pre-sale estimates. The spotlight on this auction fell upon the many studies and collections of material from the scarcest of collecting areas, those rarely offered in depth at public auction, and the results did not disappoint, cinderellas, locals, railway stamps and revenues all proving very popular. An award-winning study of the Wells Fargo Express Company in Mexico (lot 262) found a new owner for £3,570. There was strong interest in a fine section of Danish Local Posts. Believed to be the only known example, the Aalborg Kiosk Company 5ore green issued in around 1900 (lot 112, above) had many suitors before finding a new home for £1,289. 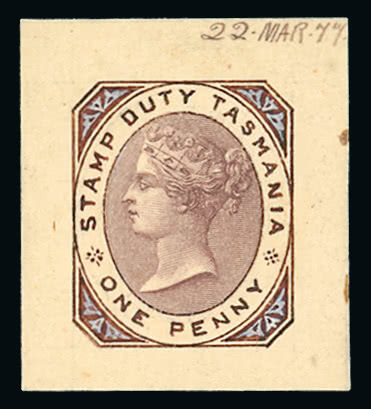 An important section of revenue material from the Australian States included the 1877 De La Rue essay for the Tasmania Stamp Duty 1d. featured on the front cover of the auction catalogue (lot 34). 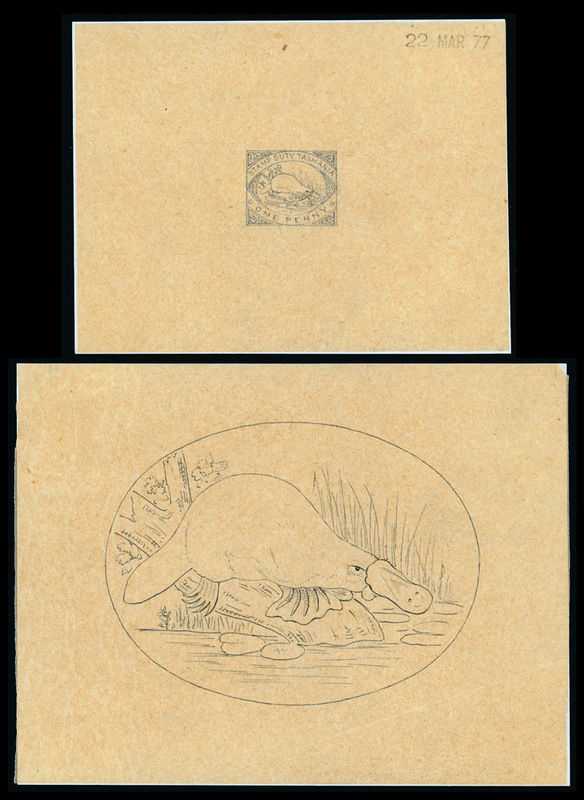 This attractive item sold for £1,844 whilst fans of the duckbilled platypus pushed the group of pencil essays produced in the same year (lot 37) to £1,228. Amongst a handsome group of large stamps produced for Beer Duty in Tasmania, £452 was paid for an unused vertical pair of the 1880 6s.9d. 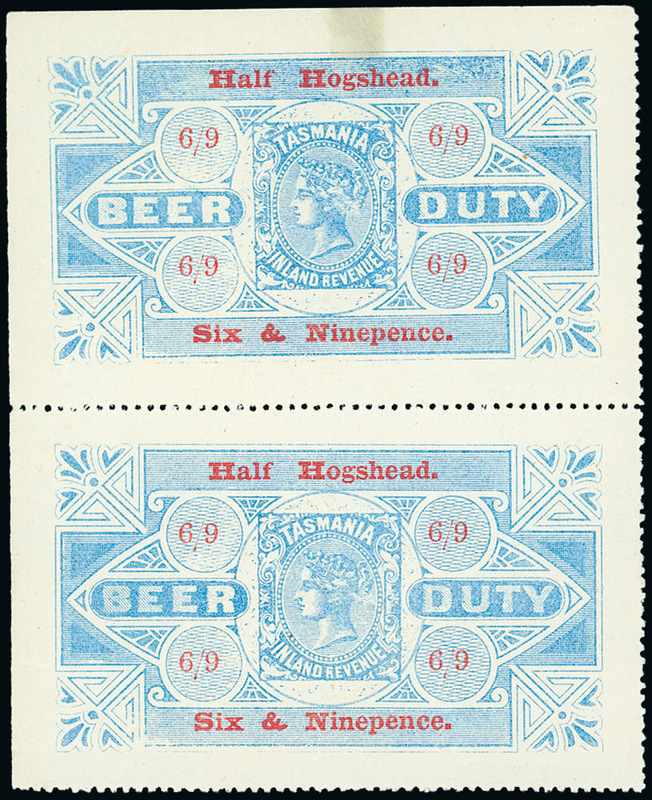 (lot 62), each stamp having once covered the revenue payment for one half hogshead of beer. Among a most unusual offering of Great Britain material, a group of ten die proofs produced by Waterlow & Sons for ‘dummy stamps’ (lot 200) was bid enthusiastically to £2,439 whilst a specialised collection of the “IDEAL STAMP” issue produced for the 1912 Jubilee International Stamp Exhibition (lot 208) was pursued with determination to £4,298.